Running a DJ air cooled gun right now and seem to be having a bit of trouble making our injectors last. We are only getting about 18 hours run time. We are seeing them not chip, but melt and the nozzle also looks a touch melted. I am starting to think our console needs to be calibrated and that our gas mix is running oxygen rich, burning the injector and the nozzle. We run on propelyne. Can anyone tell me their typical lifespan for injectors and if they agree/disagree with my thoughts? We spray mainly 86/10/4 +38 -10 with standard parameters from the Metco book. Check your carrier pressure / flow. (10-12-2012 01:31 AM)KevGarty Wrote: Check your carrier pressure / flow. Good point I have same issues and think I've ruled that out. 90 psi on reg, 80 psi canister pressure. 30 on FM. Had higher pressure before and was basically sandblasting the ID of the injector in 2hrs. I'm not sure that is it. Another point sorry, even at higher pressure they were burning out. Seems like t must be something else to me......maybe! Carrier gas flow is important as a means of cooling the injector. Commonly seen people burn these out simply by lighting gun with no carrier gas flowing. Carrier gas needs to be flowing when gun is alight, not just when feeding powder. I agree with Gordon and has seen many times at one of my friend's TS facility where the injector partially melt at injection point. They had difficulties igniting gun so carrier gas was set very low so that ignition starts well. I have air cooled gun and never had those issue since we supply/maintain the carrier flow same before/after ignition. If the powder stuck at injector, the carrier flow will drop and lead to melting too. Agreed Gordon-we have 20 FM reading when we light the gun then bring it up from there. Please see picture. This is why I'm kind of stuck on the thought that our console my be out of calibration. Thank you for that copy Kev. I believe it's the same one I use. Will review our pressure and flow now and try adjusting it up on carrier gas. If I'm not oxygen rich it is the only other thing it could be I'm guessing. Thanks again I will post my results in after a few hours of run time. Thing to remember with the Diamond Jet is you will need enough hopper pressure to overcome the back pressure from the gun and allow for a stable flow. Other than that all I can say is.....Good luck ! Added image to your post. Kev would have missed that on his reply. Yes, the picture confirmed what my friend was facing. We set the Nitrogen cylinder outgoing pressure at 175psi and 150 at control panel. See if line 14 where it enters plastic tube filter, if powder accumulated there it indicates back pressure. Some leaks take place in the hopper system and better go for calibration. You should be careful, normally you have the differential pressure switch linked to line 14, if the back pressure is higher that the supply pressure, system normally stop. If there is no detection this could mean that there is some powder locking the axis of this differential pressure switch. Your system should be checked. Well thank you thus far for all of your assistance. We seem to have nipped part of our problem in the bud. By increasing nitrogen flow we have stopped injector burn out. We still have the issue of burning nozzles as shown in my above picture. After 4 hours run time, the nozzles are melting. I am thinking oxygen rich lighting flow, in those 4 hours run time we have only lit the gun 4 times. Maybe an oxygen rich mixture? Thank goodness no leaks in the system, just too low a flow on nitrogen! If your nozzle's are burning out, could there perhaps be a restriction in the air flow keeping the gun cool ? or perhaps not enough air ? (10-18-2012 10:42 PM)KevGarty Wrote: If your nozzle's are burning out, could there perhaps be a restriction in the air flow keeping the gun cool ? To my knowledge we have no restriction, in fact I think we may have too much air that is making the flame oxygen rich, therefore too hot and melting tips. Here is the latest one from 7 hours run time. A side note: The injector looks perfect. Is this a manual lighting set up? If it is when you are lighting it how long do you keep the pilot flame on for before lighting ? I know with some manual systems if the pilot flame is left on too long the flame can burn back into the nozzle / air cap ? Things like this when you cant put your finger on the fault I would go back to the beginning/basics. 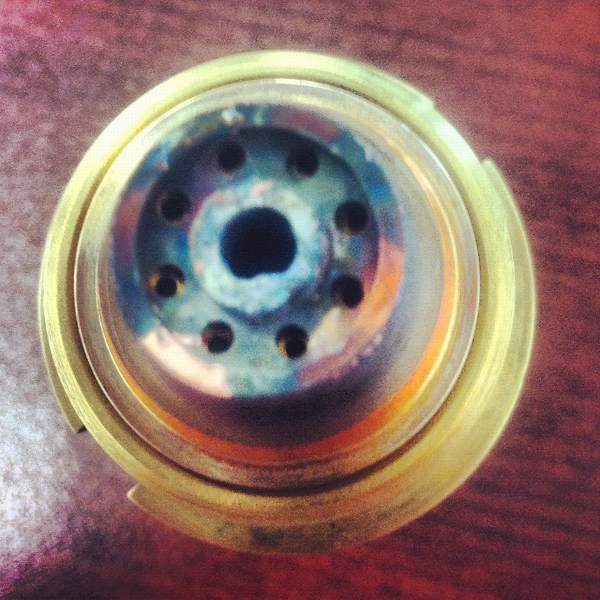 Give your gun a good clean, could possibly be a blockage in the siphon plug ? Thanks Kev this is our thought process at this point too. We do light it manually, but it`s a spark then wide open right away. No dwell. We have gone thru the gun but am going to do it again tonight and focus on that siphon plug. The way the nozzle is melting it`s like the flame is being pushed towards the center to fast, like there is too much air coming thru. Funny thing to me is that at present it isn`t melting the injector. Even in the troubleshooting in the Metco book it says if you have poor nozzle life check air flow, but it doesn`t say if it will be too high or too low! Thanks for your input, I really do appreciate it. Is this a new set up or is it just a new problem on an old system ? Has there been anything that has changed as regards to supplies to the system Air, Oxy, Fuel ?